Arrowhead Health Centers is a Valley-wide healthcare provider that focuses on providing exceptional medical care, differentiating itself by operating under a mission of putting people first. Their focus is on making healthcare easier, more accessible, and more cost effective than what most consumers are used to. The focus of my role with AHC was to bring these ideas and feelings into the branding, marketing, and overall culture of the organization. As the Marketing Manager, I was responsible for developing and analyzing campaigns targeted at highly-specialized groups. I've highlighted some campaigns below in addition to the branding work that was performed. The Arrowhead Health Centers Story Book was a 'culture manual' of sorts that was created to spell out the company's mission to all new hires and existing employees. It evolved over the years from a handbook into a branded recruiting tool. I wrote a majority of the content, designed the book, and managed the production/distribution of it. I worked with a local agency, Striventa, on the creative direction for the culture video we shot to accompany the release of this book. The final version I produced (version 6.0) also included a neat open resource feature in the back of the book that included instructions for other companies to utilize our template and framework to create their own story book from scratch. 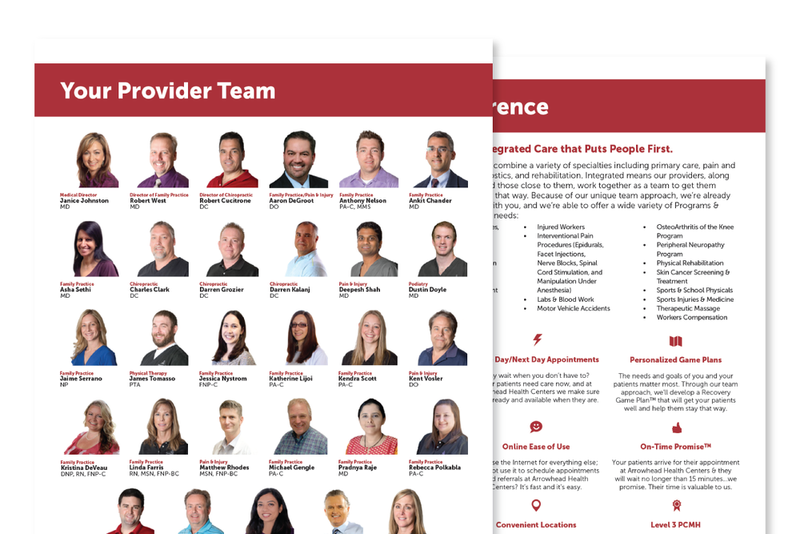 The Referral team at Arrowhead Health Centers is one of the busiest in the company - they process roughly 2,000 outbound referrals a month in addition to receiving all inbound referrals for pain management. When the team began reporting to me, I noticed that their process was highly manual, and it was causing major delays in throughput. I built a custom instance inside Salesforce to help the team manage their workflows better, which included automatic email notifications to patients and automated note creation for faster input into our EMR. Our inbound business needed a boost, too, so I worked with our Community Relationship Manager to build a coordinated campaign that explains our medical neighborhood to referring providers, helping build a sustainable system of like-minded providers who refer to one another. This new process helped improve patient experience through faster referral throughput, and also helped drive critical, high margin business into the funnel for Arrowhead Health Centers. AHC known for being an early adopter of medical technology - and in 2015, it decided to begin offering placental tissue matrix and platelet-rich plasma injections. I was tasked with creating the launch campaign for this new program. 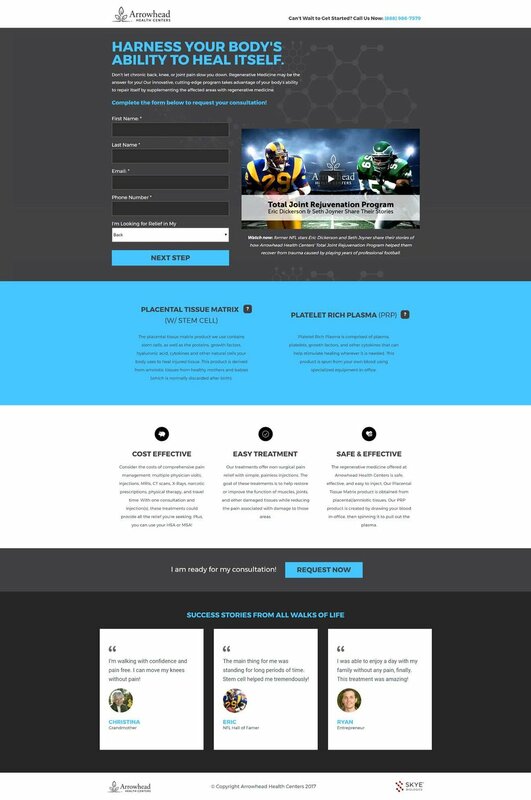 This included high-profile interviews with NFL greats Eric Dickerson and Seth Joyner, as well as a coordinated multi-channel print and digital campaign focused on driving patients to a consultation. Arrowhead Health Centers (AHC) may be most known in the Valley for its OsteoArthritis of the Knee program. I was responsible for running the marketing campaign for this program on an ongoing basis, focusing on driving attendance to seminars and free consultations. I was responsible for all copy and creative surrounding this program. This campaign required a strict focus on efficiency metrics (CPA, CPL, CPM), as its primary source of lead generation is through traditional marketing channels.